Recently we were planning a family gathering. When I asked what I could bring it was requested that I bring several different items. But one request was to bring bread of some sort (pesto bread was the recommendation). Since there are several items I’ll be baking today for our family gathering, I’ll certainly be multi-tasking since each recipe has to be timed perfectly. I’ll be making a couple of different varieties of savory breads that I’ve never made before and also a double-batch of my rich chocolaty homemade brownies plus my favorite no-cook chocolate frosting for the brownies. So I pull my basic quick beer bread recipe & read over it. I decided to make one loaf of Pesto-Flavored Bread & one loaf of Rosemary/Cheddar-Flavored Bread. But for today’s post I’ll focus on the Pesto Bread. First I pulled out all of the ingredients I’d need for my bread & measured them out. I mixed up the dry ingredients & kept the other pre-measured ingredients handy so I could add & mix quickly. For my Italian Pesto flavored beer bread I brought out my frozen pesto, chunked up sun-dried tomatoes, some mozzarella and Italian spices. Oh yeah baby, that’s the ticket! Let’s see how this all comes together. The thawed pesto looked a bit wet to me so I strained the excess oil into a coffee mug. Once that excess oil had been strained away it’s time for me to start mixing up my pesto bread. Take a deep breath, here we go! To the pre-measured & mixed dry ingredients I add the bottle of beer and set to adding my pesto add-ins: I stirred in about 1/3 cup of thawed/drained pesto & 1/2 cup of mozzarella cheese, as well as about 1/3 cup of dried chopped tomato leather that I had dehydrated from my garden last year. I also needed a tablespoon of dry Italian seasoning. I mixed it all together and poured it into a 9×5 loaf pan that I’d already oiled using some of that highly-flavored drained pesto oil. When I poured the batter in the pan I also brushed some of that reserved pesto oil onto the top of the batter. Ummmm… smells wonderful! I slide the pan into my oven that’s been preheated to 350 degrees and bake the bread for about 45 minutes. Then I pull the pan from the oven and pour on top of the bread about 4 Tablespoons of the remaining fragrant pesto oil. It sizzles as it runs toward the edges of the pan and it smells amazing! I return the loaf to the oven for the final 10 minutes baking time. When the bread is baked I remove the pan from the oven and place it on a baker’s rack for a few minutes to allow it to begin cooling. Since there’s cheese in this bread it tends to cook to the side of the pan so I slide a butter knife between the bread & the pan to loosen it and turn the pan upside down to allow the release of the bread. Then I place the still-hot bread on my baker’s rack & cover it with a towel and allow it to cool completely. When I sliced it up, the smell of pesto was heavenly. The bread was hefty, moist & soft and you could see plenty of tomato in the bread too. And the taste?? DELICIOUS! Mix dry ingredients together, then slowly add beer & stir to combine. Add the desired stir-in options for Pesto Bread & blend thoroughly. Transfer batter into well-oiled 9x5 glass loaf pan and bake on middle rack for 45 minutes. Remove pan from oven and pour 4 tablespoons of reserved pesto oil (or olive oil) onto the surface of the loaf & return it to the oven for an additional 10 minutes baking time. When baking is complete, remove the pan from the oven, carefully remove bread from pan and place on baker's rack. Cover the hot bread with a clean towel & allow to cool completely. 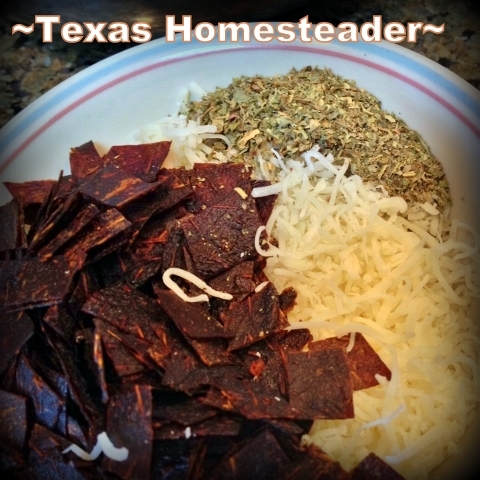 This entry was posted in Blog Posts and tagged Cooking, Frugality, Make-It-Yourself, Recipes on April 5, 2015 by Texas Homesteader. Our basil plants were crazy last year so I’m always looking for new ways to use the pesto we made. I’ll have to try this, it sounds delicious. Thanks for sharing on the Waste Less Wednesday Blog Hop! I’m often asked to bring some of my beer bread to family gatherings, too. This would be a yummy variation! I LOVE the flavor combination in this bread! Thank you for your weekly support! Thanks for sharing at the Say G’day Party! Pinned all and look forward to seeing you on Saturday! My husband would love this!! Thanks for Sharing on My 2 Favorite Things on Thursday!! Hope to see you again this week!! I Pin everything to My 2 Favorite Things Pinterest Board! Looks delicious! I’m going to try this. I just love pesto. 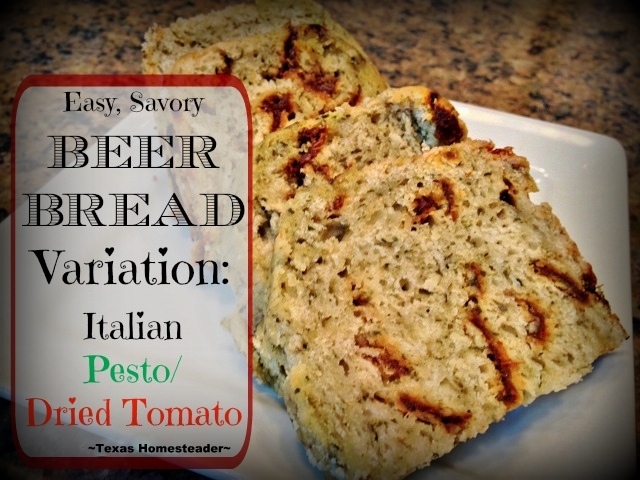 What a fun variation on beer bread. I had never thought to make such a big variation on the flavor. It sounds amazing! Yummy! Thanks for joining us at Idea Box. I hope you link up with us again this week! Oh Yum. That looks absolutely wonderful and I’m sure it tasted as good as it looks. It’s fun and interesting trying out new recipes; especially for family members first. I like to see their reaction on their faces. :} If a person doesn’t have your kind of fried tomato leather; can it be bought in the grocery store?